3. Topical Words: Plan B. 4. Questions and Answers: Egg somebody on. Welcome A special greeting to the many subscribers who have joined as a result of World Wide Words being featured in three publications in the past week: by John McIntyre in his You Don’t Say column in the Baltimore Sun last Saturday, by Eric Zorn in the Chicago Tribune on Sunday, and by Randy Cassingham in his This is True newsletter under the heading Bonzer Web Site of the Week. He features events from the news that are bizarre but true — I’ve been a subscriber for many years. You might like to follow up the dated Australianism bonzer — today celebrated more outside the country than in. The Fifth of November in Britain is a traditional festival marked by bonfires and fireworks. It commemorates the day in 1605 when a group of conspirators, including the infamous Guy Fawkes (in truth a minor member of the plot), failed to blow up the Houses of Parliament and with it King James I of England. It’s celebrated privately less than it used to be because of the high cost and perceived danger of fireworks, but public events remain common. A Tourbillon is a sort of double rocket, having orifices so placed as to produce a double recoil — one rotatory and one vertical — the Tourbillon revolves and ascends at the same time, and is an exceedingly beautiful and brilliant firework. Household Words, 10 Sep. 1853. Putting it another way, it produces a vertical spiral of flame and sparks. The fire-works were then displayed, and consisted of several thousand rockets, cascades, archimedean screws, wheels, fountains, fixed and vertical suns, marrons, tourbillons, pots de brin, fire-ballons etc. London, or Interesting Memorials of its Rise, Progress & Present State, by Joseph Clinton Robertson, 1824. Like many other firework names, tourbillion is from French. The French influence derives from an early work on the ceremonial and recreational uses of fireworks published by the military engineer Amédée-François Frézier in 1706. Tourbillion is from tourbillon, a tornado or whirlwind, which can be traced back to Latin turbo, something that revolves or spins, such as a top, a whirlpool or eddy, or a tornado. Tourbillion in English has had the last two of these senses and is also known to watchmakers as a rotating cage that’s designed to offset the movements of the wearer. 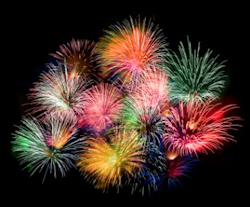 Other firework names from French include crossette (little cross), which breaks into pieces to make a cross shape; gerbe (a sheaf of wheat), which throws up a fan of coloured sparks or flames; maroon (marron, a chestnut), which makes a loud bang like a cannon (it’s said to derive from the noise of a chestnut bursting in the fire); nautic (nautique, nautical), a firework that floats on water. A pot de brin was described by Charles Dickens in the same article in Household Words as “a case or cavity from which serpents, stars, and crackers are thrown up into the air”. It’s extraordinary what fuss a little letter can cause. “And what is pattern B?” asked Ann Halsey. The Black Cloud, by Fred Hoyle, 1959. To label alternatives with letters is now so fashionable as hardly to warrant much comment, even though to develop possibilities much beyond Plan C is either to suggest an over-controlling and anxious personality or strategies that contemplate extraordinary contingencies. Plan Z gets some attention, but usually as one so far down the list it can only be crackpottery. Even Plan B is more often a humorous comment on a Plan A that has proved impracticable (“we need a plan B”, “time for plan B”) than a serious potential alternative. Legal documents have identified plans and drawings by letters for at least a couple of centuries. The origin of the figurative expression partly lies here, but more specifically in plans that illustrate alternative proposals for a development (“The scheme shown in Plan A for remodelling the house is more expensive than the alternative outlined in Plan B”). The Oxford English Dictionary has entries for both Plan A and Plan B which imply that they originate in the US. However, its earliest citation for Plan B — a letter sent during the Civil War in 1863 — turns out to refer to a physical drawing or plan. I have found a British example, from the Report of the proceedings of the Church Congress held in Cambridge in November 1861, where it refers to one of two proposals for a scheme to modify church taxes. The first known example of Plan A is currently from an equally improbable source — the 1867 Report of the US Commissioners to the Paris Universal Exposition of that year. Q From Ted Setterington: Please can you explain how we came to egg things on? “People are emotional, agitated, so they are easy to influence. It doesn’t take much to egg things on,” he said. Oakland Tribune, 10 Jul. 2010. The Sun (London), 5 Sep. 2011. Several photographs were attached, but I’ll spare you those. Despite its spelling, it has nothing to do with actual ova. Those involved are not being persuaded into their actions through fear of being pelted with eggs, nor are eggs employed in any other way. The source is quite different and its spelling is accidental, the result of orthographical convergence. The origin is actually the Old Norse eggja, to incite, which is related to Old English ecg, an edge, and to the Middle Low German eggen, to harrow. That might suggest you egg somebody on by poking them in the back with something sharp, but the connection doesn’t seem to be so literal. Anyhow, the word came into English around the year 1200, initially in the sense of provoking or tempting a person. Our modern form isn’t so ancient, but old enough, appearing in the middle of the sixteenth century. By the time egg somebody on had appeared, the spelling had changed through being influenced by eggs of the consumable sort. • Seen by Ian Harrison on an advertising sign placed by a well-known local supermarket in Johannesburg: “Whole chicken pieces.” How would one tell? Last modified: 5 November 2011.